Patrícia Sousa is a Research Fellow at INL in the group of Microfabrication and Exploratory Nanotechnology. Patrícia has a background in microfluidics with emphasis to the flow of complex fluids, such as biofluids (e.g. blood) and polymeric solutions. She received her Ph.D. in chemical and biological engineering from the Faculty of Engineering, the University of Porto and her thesis won the Iberian award for the most distinguished thesis in rheology. 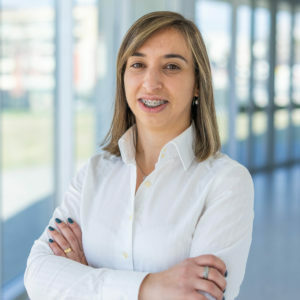 Her postdoctoral research at Faculty of Engineering, University of Porto focused on the development of a fluid mimicking whole blood rheological characteristics. Additionally, Patrícia was an invited Assistant Professor in the chemical and mechanical departments of the Faculty of Engineering, University of Porto. Sousa, P.C., Vega, E.J., Sousa, R.G., Montanero, J.M., Alves, M.A. Sousa, P.C. and Pinho, F.T. and Oliveira, Monica and Alves, M.A. Extensional flow of blood analogue solutions in microfluidic devices. Journal of Non-Newtonian Fluid Mechanics (2010), 165 (11-12), 652-671. Soulages, J. and Oliveira, Monica and Sousa, P.C. and Alves, M.A. and McKinley, G.H. Investigating the stability of viscoelastic stagnation flows in T-shaped microchannels. Journal of Non-Newtonian Fluid Mechanics (2009), 163 (1-3), 9-24.